Facebook: Today, we’re making some changes to the Trending feature on Facebook that will make the product more automated and will no longer require people to write descriptions for trending topics. 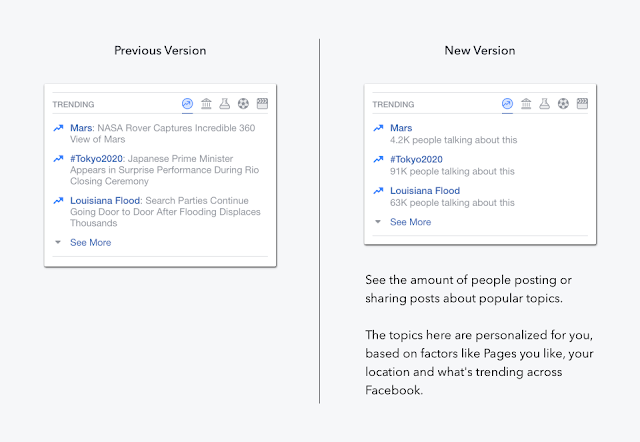 We added Trending to Facebook in 2014, and similar to Search, Trending was designed to help people discover interesting and relevant conversations happening on Facebook, about breaking news and events from around the world. Our goal is to enable Trending for as many people as possible, which would be hard to do if we relied solely on summarizing topics by hand. A more algorithmically driven process allows us to scale Trending to cover more topics and make it available to more people globally over time. This is something we always hoped to do but we are making these changes sooner given the feedback we got from the Facebook community earlier this year.